Dr. Nina Vaidya received her undergraduate degree in Electrical & Information Engineering from University of Cambridge, England, UK and a Ph.D. in Electrical Engineering from Stanford University, CA, USA, for work on design & fabrication of graded-index optical concentrators and 3D printing to create optics with nanometer smooth surfaces. Presently, Nina is a postdoctoral scholar at Caltech in the Space-based Solar Power Project (SSPP) and works on advanced optical and material design- simulations, optoelectronic characterization, fabrication techniques, and prototyping. She conceptualized and demonstrated ultra-lightweight & flexible carbon fiber reinforced polymer (CFRP) mirrors. Nina also works on new fabrication techniques and materials like polymer mixtures and perovskite solar cells. Before her Ph.D., Nina worked as a strategy consultant for international engineering companies & OEMs (Original Equipment Manufacturers). 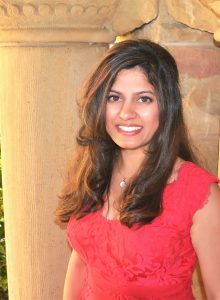 Nina was a Stanford DARE (Diversifying Academia, Recruiting Excellence) scholarship fellow and involved in outreach activities as an IEEE industry liaison, a WIE (Women In Engineering) officer and a member of EWB (Engineers Without Borders).